Does it seem like granola always tastes like cardboard and rocks? Bear Naked is ready to change your mind. The Fruit and Nut granola; filled with raisins, dried cranberries, almonds and walnuts, is soft-baked so you won’t break your teeth. Bear Naked products contain no preservatives, so be satisfied without worrying about ingredients you can’t read. 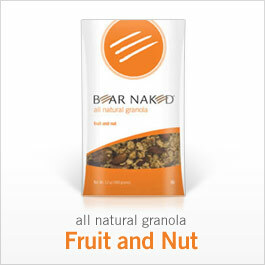 This entry was posted in Food & Drink and tagged Bear, Granola, Naked. Bookmark the permalink. What about hippies? Is it great for hippies?